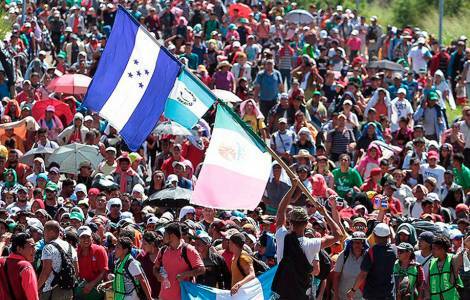 Mexico City (Agenzia Fides) - "Migration, both in Central America and in Mexico, is just the tip of the iceberg of millions of people suffering from poverty, injustice, violence and corruption", reads the editorial of the Information Service of the Archdiocese of Mexico (Siame) sent to Fides. Under the heading "Our duty towards migrants", the editorial calls for a serious reflection of what is happening in Mexico these days. "Thousands of brothers from Central America - mainly from Honduras - today pass through our territory, in a historical exodus that pursues the ‘American dream’. The caravan of migrants is a challenge for Mexico", the text reads. "For the Catholic Church, no human being is illegal, and this legitimate demonstration of thousands of people who seek their survival must go beyond the suspicions, indications and political or legal implications, because it is a cry of denunciation of 'silent and inhuman displacement', as the Mexican Bishops said, who did not hesitate to mobilize to provide assistance to migrants". The editorial text ends by asking Mexicans not to see a "threat" in the caravan, but an opportunity of Christian service, remembering that we are dealing with human lives. The phenomenon has provoked many international reactions: the Bishops of the United States, for example, yesterday published a letter signed by the Commission of Migrations and Institutes of Charity in which we read: "As Catholic agencies that assist poor and vulnerable migrants in the United States and all over the world, we are deeply saddened by the violence, injustice and deterioration of the economic conditions that force many people to flee their homes in Central America. The nations have the right to protect their borders, this right derives from their responsibility: but governments must apply laws appropriately, treat all people with humanity and ensure due process. We reiterate that seeking asylum is not a crime. We urge all governments to respect international law and existing national laws, that protect those who seek a safe haven and ensure that all those who are sent back to their country of origin are safely protected and repatriated".